Whatever else any great American playwright has done, each one has created, and in turn become identified with, a personal vision of the American family. If anything, the measure of achievement in American drama has been a writer's ability to place a vivid family portrait within a larger, societal frame - or, more to the point, to make the family represent not only the writer's inner life but a set of outer conditions. One thinks of Arthur Miller's men, hustlers who lived through one Great Depression and live in fear of another; of Tennessee Williams's women, cut loose with the fall of the plantation aristocracy and thrown into the cruel cities. O'Neill, Odets, Inge, Albee - all conjure images of the family at war with itself. And in a cycle of family plays stretching over a decade - and culminating with the opening of the newest one, ''A Lie of the Mind,'' on Thursday at the Promenade -Sam Shepard has painted a picture of domestic disharmony as striking as any to have preceded it. The wastrel father of ''Curse of the Starving Class,'' the Cain-and-Abel brothers of ''True West,'' the incestuous lovers of ''Fool for Love'' have become indelible characters in the contemporary American theater. So, too, has Mr. Shepard staked his claim to the landscapes - both geographical and psychological - of the rootless American Southwest and the beleaguered Middle Western farm belt. The elements of Mr. Shepard's mythology coalesce again in ''A Lie of the Mind.'' This sprawling play runs more than three hours and follows two families, one in Montana and the other in Southern California, that are bound by the brutal marriage of two children. (The lovers are played by Harvey Keitel and Amanda Plummer and the rest of the cast includes James Gammon, Geraldine Page, Will Patton, Aidan Quinn, Ann Wedgeworth and Karen Young, with music by the Red Clay Ramblers.) In its vast scope and in several of its themes - possessive and violent love; guilt, escape and lies - ''A Lie of the Mind'' resembles Mr. Shepard's screenplay for ''Paris, Texas'' more than his recent plays. The film version of one of them, ''Fool for Love,'' also opens this week - Friday at the Plaza - with Robert Altman directing and Mr. Shepard starring. 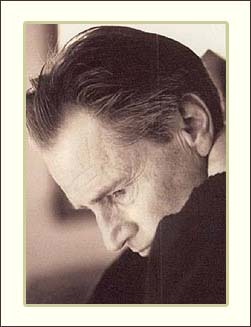 As Don Shewey points out in his recent biography of the playwright (''Sam Shepard,'' Dell Books), Mr. Shepard's cycle of family plays departed from his earlier work. Mr. Shepard lived and wrote amid the East Village's experimental theater movement, and from 1963 through 1976 his plays tended toward the fantastic and his creations included cowboys and rock stars, bayou monsters and B-movie gumshoes. Then, with ''Curse of the Starving Class,'' Mr. Shepard began to penetrate his own past and to work in an increasingly naturalistic vein. Each play since then has peeled back more layers of the playwright's itinerant upbringing and, particularly, of his relationship with his father. Still, Mr. Shepard acknowledges the transition in his work since ''Curse of the Starving Class.'' ''I thought for years it was boring, uninteresting to write about the family,'' he said. ''I was more interested in this thing of being wild and crazy. To be unleashed, to drop the reins. Mr. Shepard has created two fathers in ''A Lie of the Mind,'' each with apparent echoes of his own. One lives with his family in Montana but longs to leave, blaming his wife and daughter for ruining his life. The other father is never seen onstage. He deserted his family, the audience learns, and went to live in a house trailer with cheap wine and photographs of old movie stars. Stumbling drunkenly along a highway after a drinking contest with his son, he was hit by a truck and killed - a death, needless to say, with some parallels to the real Mr. Rogers's. In the film of ''Fool for Love,'' the character of The Old Man, the common father to the lovers Eddie and May, assumes an even greater importance than he did in the original stage version. There The Old Man sat on the side of the stage, sipping whisky and occasionally speaking. The Old Man of the film is a constant, active presence - a ''Twilight Zone''-style gremlin or some kind of malevolent puppeteer. The film opens with The Old Man plaintively playing harmonica, as if to summon Eddie toward his confrontation with May. The Old Man steals tequila out of Eddie's truck, eavesdrops on Eddie's fights with May, and, until the secret of his two lives is revealed, delights in their destruction. Sam Shepard's actual ''old man'' was an even more complicated character. A World War II flyer (like the offstage father in ''A Lie of the Mind''), he attended college on the G. I. Bill, read Lorca, Neruda and Vallejo, taught high school geography and Spanish and studied at the University of Bogota on a Fulbright scholarship. He could be a beguiling teacher at school and storyteller at home. He also was an alcholic, a father who fought bitterly with his son, a husband who frequently vanished from his family. More than 20 years after he first arrived in New York, Mr. Shepard also faces vastly different expectations. No longer is he just another aspiring writer, holed up on Avenue C; no longer is he even the Off Off Broadway hero whose name meant little north of 14th Street and even less west of the Hudson. Now he is a movie star, gossip column fodder and arguably the finest American playwright of his generation. Yet the surroundings have changed more than the man within them. Mr. Shepard sits for an interview with cowboy boots, jeans, a flannel shirt and a trucker's thermal vest. His conversation grows most animated not on the subject of writing but of blues and country music. He speaks knowingly of Lightnin' Hopkins and Roscoe Holcombe; he is up to date on ''Don't Mess With My Toot-toot,'' the surprise hit from Cajun country. And it sounds geniune when he professes not to feel the pressure to top, or at least equal, himself.